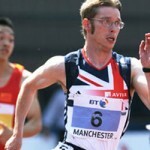 Jonnie Peacock (coach: Dan Pfaff) created a huge shock overnight (30 June) running 10.85 seconds (+0.7m/s) for the T43/44 100m at the US Paralympic Track & Field Trials, a World Record mark that eclipses the times set by South African `Blade Runner’ Oscar Pistorius and USA’s 2004 Paralympic Champion Marlon Shirley. Single leg amputee T44 athlete Peacock, who only turned 19 in May, led home a strong field that included World Champion Jerome Singleton, former Paralympic champion Shirley and last year’s Parapan American Games gold medal winner Jarryd Wallace. His time of 10.85 was 0.06 second faster than the previous T44 record set in 2007 by Shirley and was also faster than the 10.91 mark set by T43 sprinter Pistorius five years ago. Peacock was not the only record breaker in Saturday’s 100m race. In finishing second in 10.95 Blake Leeper, a fifth place finisher at last year’s World Championships, set an Americas record and became the first American T43 sprinter to go under 11 seconds. Third place went to Richard Browne (11.16), World Champion Singleton (11.17) finished fourth, Wallace (11.44) took sixth with Shirley (11.45) coming hone in seventh in an extremely fast race that saw all top five finishers beat the 11.34 time Singleton ran last year to be crowned World Champion in New Zealand. Peacock’s World Record has made the already much anticipated men’s 100m T43/44 London 2012 Paralympic final on Thursday 6 September an even more mouth watering prospect. The line-up in the Olympic Stadium is expected to include new World Record holder Peacock, reigning Paralympic Champion Pistorius, World Champion Singleton, Americas record holder Leeper together with South Africa’s Arnu Fourie. Brazil’s Alan Fonteles Cardoso Oliveira, a bronze medalist at last year’s World Championships, is also expected to be a contender. Other British highlights over the weekend have so far included World Records for Mickey Bushell (Fred Periac) in the men’s T53 100m (14.38/+1.3m/s) and Hannah Cockroft (Peter Eriksson) in the women’s T34 200m (31.23/+1.0m/s), both athletes improving their own global best marks; and lifetime best performances from Ola Abidogun (Steve Thomas) and Jade Jones (Ian Thompson/Tanni Grey-Thompson). Abidogun, the double IWAS World Junior Champion in 2011, lowered his PB times in both the 100m (11.05/+0.9m/s) and 200m (22.54/+1.5m/s) while Jones, who has made progress across a number of events in 2012, clocked new PBs in the 400m (56.58), 800m (1:51.55) and 5000m (11.56.31). 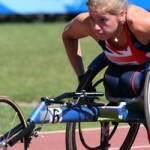 The British track and field team for the Paralympic Games will be announced on Tuesday 10 July. To see footage of Peacock’s world record breaking run, please follow the link. 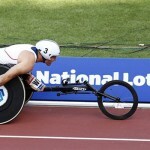 visit The US Paralympic Track & Field Trails conclude on Sunday (1 July).